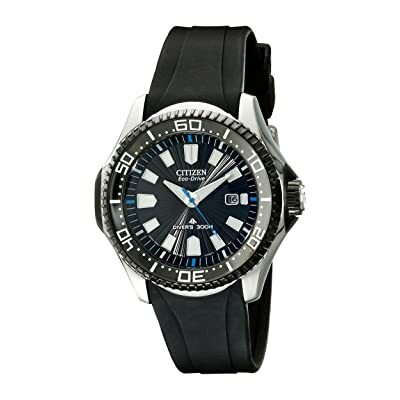 Citizen Eco-drive dive watches for men have been prevalent in the US market for a long time. Citizen holds the upper hand in the field of solar-powered wristwatches, even Seiko – The No.1 watchmaker in Japan, is ranked second to them in this field. Sized at 46.6mm, this is not a small watch by any means so its suiting common men’s wrist is out of the question. However, to be honest, the case is very well-constructed, its hexagonal shape is aesthetically distinct from many existing round dial diver’s watches. The watch has a rock-solid body, but not chunky, its robust design makes a good choice for sporty guys. The case rides on a comfortable 23mm rubber strap that tapers down from the lugs to the buckle. The luminescent keystone and shield-like hour markings contrast very well with the sunburst dial, making for superior legibility. The whole face looks clean and clear, the sky blue and the white colors highlight each other. The beveled coin-edge bezel holds an incisive appearance, adding much to the watch’s boisterous look. The slightly curved crystal magnifies the dial underwater. There’s a room for improvement here, the glass is too vulnerable to direct hits, not like those of the Seiko dive watches, which are better protected by the bezel which is placed a tad higher. Since the BN0085-01E features a light driven quartz movement, it doesn’t need battery changing and can keep on trucking for over 4 months in total darkness after fully charged, but in reality, the watch rarely runs out of battery due to your frequent outdoor using. Shortly, all the details on this watch appear to contrast with those of the BN0085-01E. One is chubby-looking, and the other is angled. Despite being visually contrary, these two watches are both Citizen Eco-drive dive watches, which have 300m water resistance rating and feature highly accurate solar-powered quartz movements. This giant 48mm wristwatch is unmistakably a heavy-duty diving piece. You’ll hardly find a chance to use it for casual wear due to its exceptional 18mm thickness. This oversized wristwatch simply can’t sit under your shirt cuff. It’s a downright sport watch. Despite being so massive, the watch looks much better on a stainless steel bracelet rather than on a rubber strap, but the metal band will inevitably add much to its already-heavy weight. You will notice that the guarded crown is positioned on the left, unlike most of existing dive watches. This kind of design seems to be out-of-the-way, but it’s actually a reasoned disposition, the crown is better protected on the left because the right side suffers most of external physical abuses. The knurled bezel makes for a good grip, it’s rather thin compared to the overall thickness of the case. The dial is too small, so is the date window, they make the watch looks a tad dispropotionate. However, the watch’s readability is superior thanks to the contrast between the hands, the hour markings and the matte black background. As the BJ8050-08E is also an Eco-Drive dive watch, it shares the same mechanical properties with the two watches above. Due to its fierce looking, the watch has such a “lovely” nickname – Ecozilla, which means “the Godzilla Monster of the Eco-Drive series”. If you want a watch with Navy blue tone, this diving piece is for you. It caught my eyes at first sight with its charming dark blue color. Sized at 42mm, this is a robust watch, but not too big! Going with a polyurethane strap, the watch might not look so dressy. But you can easily replace the stock band with a textile, leather or metal one, your watch would look much dressier and fit in well with almost any kind of apparel. The radiant dial is what I love most about this watch. Its sunburst patterns make for a very attractive look under sunshine. The painted bezel’s blue is a tad lighter than the dial’s, but they blend in very well with each other. The watch would look very monotonous with just blue and white. Citizen knows that, so they added an orange accent to the minute hand, the hour hand remains stack white. The chrome borders around the markers also add some interesting flares to the dial, to me this is a big plus! What’s not to love about this watch? Well, it’s the date aperture at 4 o’clock. The dial is not too crowded, why Citizen had to cut the marker in half to make room for a tiny square window? The date aperture looks like a beauty-spot on the watch face, and I personally don’t like it. Fortunately, the dial’s overall appearance is not affected much! One more thing I don’t like! The mineral glass is anti-reflective! Is it a must? The hands & markers contrast very well with the dark background, providing a clear legibility, some reflection surely doesn’t make the watch difficult to read. That being said, you can replace Citizen’s glass with another mineral crystal which can twinkle under sunshine, just a few bucks, no big deal! When it comes to functionality, this piece is as reliable & accurate as other Eco-Drive dive watches in this list. However, its water resistant depth is just 200m (660 feet), inferior to the 3 diving pieces above, which can operate 300m under the sea. How deep do you often dive? 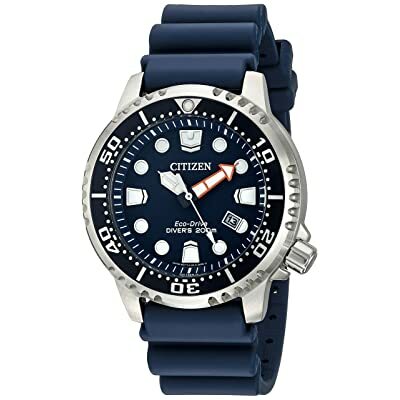 With the price of just over $200, the Citizen BN0151_09L Promaster is worth your money, because it’s not only a reliable diving tool, but also an eye-catching Navy-blue timepiece which can be dressed up or down easily depending on occasion! Featuring a 45mm case, this watch is not a good choice for small-wrist users. Its sporty design makes for a very attractive look, but surely not for everyone. If you want an elegant timepiece, just choose some other one. What makes this watch so eye-catching? It’s the two-tone resin strap with citron yellow accents. Imagine what this watch looks like if it’s just colored in black and white? Too monotonous, isn’t it? The two-tone strap is really what I love most about this watch! The dial is also very well-designed with beehive patterns, its background appears radiant under light, not matte-black. As I said, my taste runs into watches which sparkle in the sunshine, so I really love this piece’s dial. All the markers, hour & second hands are stack white, but the minute hand is bordered in green, the same color with the first quarter of chapter ring. Together with the citron yellow accents on the strap, these green parts really make the watch look more youthful and sporty. 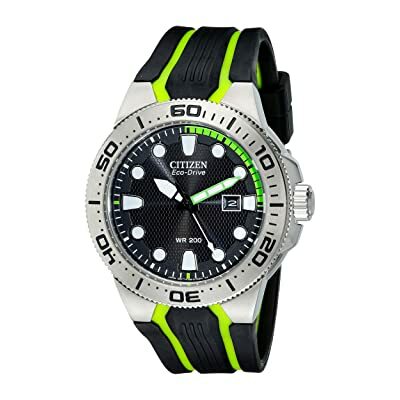 From the start, Citizen didn’t aim to produce “elegant” dive watches like Invicta or Orient, it was how they managed to differentiate themselves from competitors. The bezel is beveled in order to make the watch look not too thick. Its brushed surface is naked, no paint, so you don’t have to worry about its accumulating scratches over time, metal can be polished easily, you can’t do that with a painted bezel. This bezel is a little stiff out of the box, but it’ll loosen up soon, no big deal! The Scuba Fin has the same water resistant depth with the Citizen BN0151_09L Promaster above – 200m (660 feet), but as you can read on its dial – “WR200”, this piece is not ISO6425 certified. With me, the ISO certification is not so important, Citizen watches themselves are reliable enough! Two-tone band, brushed silver case, charming radiant beehive dial, a perfect combination for those who love active & sporty looking diving watches. 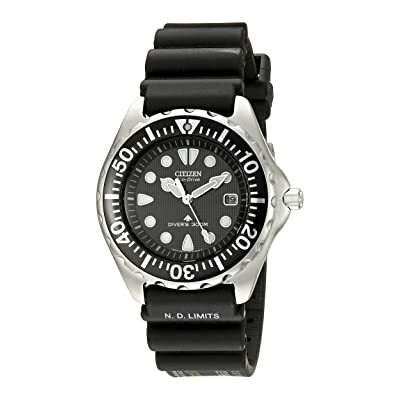 This Scuba Fin is not the type of “elegant dive watches”, but it’s attractively dressy in its own way, not too rugged. 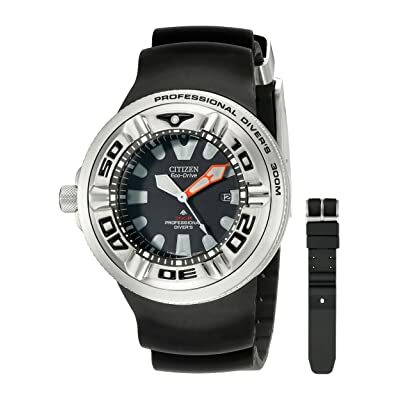 In terms of functional performance, I have no complaint about these Citizen Eco-Drive dive watches for men, they exceed users’ expectations. However, when it comes to styling, these timepieces are not ideal choices for anyone. Their unique designs are a plus. But their first and foremost role is to be fully featured diving tools, not to be versatile watches which suit casual wear. So before making the purchase, you should rethink your ultimate purpose of use.